SANTA MARIA, Calif. -- The launch of a Japanese cargo freighter for the International Space Station has been delayed to at least Saturday because of thick clouds predicted over the country's island launch site this week. Originally scheduled for Thursday, liftoff of Japan's second H-2 Transfer Vehicle is now expected no earlier than 0537 GMT (12:37 a.m. EST) Saturday. The instantaneous launch opportunity is at 2:37 p.m. Japanese time. Nicknamed Kounotori 2, which means white stork, the spacecraft will blast off on an H-2B rocket from Launch Pad No. 2 at the Tanegashima Space Center, a spaceport off the southern coast of Japan. Forecasters say thick clouds will envelop the Tanegashima Space Center Wednesday, increasing the threat of lightning striking the rocket after liftoff. The clouds are expected to clear later this week. The 35,000-pound craft will reach the space station Jan. 27, approaching from below as astronauts extend the lab's robot arm to grapple the free-flying freighter. The crew will berth the HTV to the station�s Harmony module for a stay of up to two months. Stretching 33 feet long and 14 feet wide, the HTV is loaded with 8,498 pounds of scientific gear, crew provisions, spare parts and computers. That's more than the cargo load aboard the first HTV mission, which launched in September 2009 and spent 43 days attached to the space station. The first HTV carried extra propellant and batteries for one-time flight demonstrations, but the next spacecraft won't do those maneuvers, freeing room for more supplies. 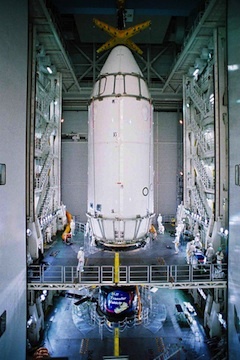 The H-2B rocket will roll from Tanegashima's Vehicle Assembly Building to the launch pad about a half-day before blastoff. After making electrical, communications and propellant connections, the launch team will begin filling the 186-foot-tall rocket with cryogenic liquid hydrogen and liquid oxygen. Enclosed within the rocket's payload fairing, the HTV was moved Jan. 7 from a processing facility to the VAB. Workers attached the spacecraft to the launcher the next day.